Ginny offers sensitive, comprehensive body work and clairvoyant readings. Her spirit-to-spirit communication facilitates change in the client's space. Ginny has 31 years of reading and healing experience and has completed several in-depth certification programs. She is a graduate of the Berkeley Psychic Institute and has completed extensive post-graduate programs. (By 1991 Ginny completed a total of 5 programs). 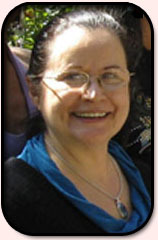 Ginny completed the five-year Trance Medium program at the Aesclepion Healing Center in 1996 and the three year Trance Medium Control Program in July 2001. Ginny has completed the Hands on Healing Programs and Spiritual Wellness I and Spiritual Wellness II program at Aesclepion. She is certified in Swedish Massage, Asian Systems, Sports/Deep Tissue Massage and Touch for a Diverse Population and Hot Stone Therapy by the McKinnon Institute. Since 2001 Ginny has been attending Upledger Institute programs in San Francisco and has completed CranioSacral Therapy I & II, SomatoEmotional Release I & II, and Advanced CranioSacral Therapy I. She is currently in the Teachers Assistant Program and "TA'S" classes for the Upledger Institute. Ginny offers many different ways to continue the process of "Integrating the Spiritual with the Physical".